Ensure that your finished sauces and purees have a smooth texture with this Tablecraft 84 8" fine tin double mesh strainer! This 6 1/4" round tool is great for straining a variety of clumpy or grainy ingredients so you can serve your guests a finished product with the right consistency. It can even be used for sifting flour and sugar, as well as dusting powdered sugar over cakes. Mesh strainer great for sauces. Easy to clean.. price is just amazing. Can hang for easy access. Price is just amazing. Would recommend this product. This went into the trash shortly. It is a wonderful design although I noticed it started rusting around the ring where it connects to the mesh. Then the mesh started to as well. As for quick clean up was easy, it never really dried well enough. Thank you for the review Marci. We recommend that these items should be hand washed and dried thoroughly to avoid rusting. This Tablecraft strainer is excellent at its purpose, but the handle is a bit uncomfortable. The wire around the outside makes gripping it a little painful for long amounts of time. The double straining system, however, works wonderfully. Love this strainer. It was used during kids cooking camp to strain ginger root tea and blended watermelon to make watermelon fresca. It worked great for both. I love how fine this strainer is and I wanted to love it so bad but unfortunately it rusted after about the third or fourth use. Thank you for the review Anna-Lee Gonsalves. We recommend that these items should be hand washed and dried thoroughly to avoid rusting. 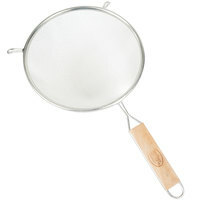 The Tablecraft 8" Fine Tin Double Mesh Strainer is sturdy and the tin doesn't break or tear easily. It is sturdy and easy to clean. This strainer is very sturdy and useful for several things. I use it for straining soups and stocks, as well as sifting flour. The hooks let it sit on a bowl very sturdily. Make sure to dry it well, it will rust if left wet. The straining function is fine. It does well at getting a finer strain. But I don't love the wooden handle connection with the metal pieces. I've since switched to a strainer that is completely metal and I feel it holds up a little better. Also easier to ensure it gets clean. Thank you for your feedback, Jessica! We are sorry you did not prefer this product, but we are glad you found something that works for you! Good strainer for the price but doesn't feel like it would last. The handle at the neck is a not very strong so I wouldn't use it to strain heavy content. It is also starting to show some minor signs of rusting in the wired rim area. I expected as much though given its Tin and to prevent rusting you need to get excess water off Tin ASAP, leaving no droplets of moisture but given the folded rim, thats pretty much not possible. Still, for the price and double mesh nature, its not bad for occasional use but heavy duty, you might as well invest its cost as a starter for a more expensive durable strainer. Not much to say about this; it's a strainer. The double mesh wiring allows for a finer strain. The wooden handle is always nice to me because it feels better in hand and ages nicely over time. There's a hook on the handle to allow you to hang it, and little metal parts on the basket itself that allows you to rest the strainer over-top a bowl instead of holding it up with two hands. I like all of my stocks and sauces to be super smooth and particle free and these fine mesh strainers are perfect for that. I make a lot of sauces and moles and things and these take a beating. I was looking for sturdy good size double mesh strainer, and this one is exactly what I need. It's well made, easy to clean, and the price is very reasonable. For the cost the table craft line of fine tin mesh strainers are a great value. Its not fair to compare it to a higher end strainer, however if used as they are intended they are a great addition to the kitchen. These are not very high quality strainers but work well enough and are reasonably well made. The way the wood is attached to the metal handle though is atrocious in my honest opinion. It just kind of wedged in there. I feel like the wood is going to fall out any time now. I have this Tablecraft double mesh strainer along with a 6 inch model. Both of them are made ok. They do dis color when run through the dish washer and the wooden handles do get lose. You might want to limit their trips through a dish washer to prolong their life. We have been using this Strainer during the past 2 days and our employees are happy. Good quality, easy to clean and the materials are resistant. This strainer does the job well but is not very sturdy. We use it to strainer tea and after just one month of use, it has a hole in the mesh. Great strainer at a very fair price. Double layered holds up good here. Some of our food is frozen and when thawed we push and squeeze the water out and so for its holding up. This strainer does its job very well, and is a great value. Be warned, however, the item will rust if not hand washed, which is a bit of a disappointment, but to be expected at this price point. Although not as sturdy as a strainer with an all-metal handle, I do like the grip this strainer provides with its wooden handle. This is a great strainer if you need something strained really fine because of the double mash I find that it takes a long time to sift powdered sugar threw it because of how fine strainer is but that's not necessarily a bad thing but that is one thing that I found with the strainers that it is very fine and it does a really good job! Got this item about a month ago. I am happy with the quality and construction of the item. I would buy again if the need arises. I make a lot of different types of rice, this is fantastic to use. I make also a sauce to go over the rice from spices bought here. I love this 8" fine double mesh strainer by tablecraft. The price can not be beat, it is so well made! Still looks brand new, after using it a few months! Good quality. Great price. We use this to sift through our various breadings. Works perfect and keeps our breadings clean. Nice size and durable, too. This mesh strainer is built well, it has a fine and coarse filter that catches most everything. Two ear tabs help hold it on bucket's etc. This has been my go to strainer for about four months so far and has preformed quite well. My only issue with it is the wooden handle, but that being said I would still buy it again. I like a lot of products from webstaurant and tablecraft, but this was a disappointment. The positive is it's a double mesh strainer. Although the holes are not as tiny as what you'd expect from the fine mesh strainer, it's still not that bad. The huge negative is this strainer is rather weak. You need to only use this for lightweight items and still be careful when using it. The handle will not hold well for too long. If I'm using this for rinsing rice, it will only be a matter of time before it breaks. Sifting flour will be okay. Just be careful when straining hot items. Also, the wooden piece within the handle is rather rough and I had to buff it to avoid splinters. From the attached image, you can see the tablecraft logo is missing - unlike the product image. Makes you wonder. Thank you for your review! We are sorry that the strainer did not work out for you. We will be sending you a replacement strainer at no additional cost. This 8" strainer is very strong, the double mesh is great for straining out smaller items. The handle is durable, so you get a good grip on it when using. Great quality for a bargain price ! The double-mesh filters big and small particules easily and is easy enough to clean. The weldings are not the most beautiful to look at but they seem real solid ! Good buy ! What can you say about these filters. This is a Double mesh filter that gives you an extra layer of filtering. The price is outstanding for the value you get. The other major suppliers will charge you double for the same product. I have bought 3 of these so far, and recommended them to my friends/coworkers. The tablecraft 8 4/8" fine double mesh strainer seems well made and of good quality. The wooden part of the handle was a little soft, but I think it will be fine for my purposes. why did i wait so long to get this strainer? it is strong, well made and easy to clean with a sink sprayer. I use it every day. This works great! It was a steal at this price. We use it all the time for cooling coffee beans, and many other things in the kitchen. Good strainer, impressed with quality. Works well for dusting powdered sugar on top of pancakes and strawberries. Cleans easily when rinsed with warm soapy water. What can I tell you...For the price, you can't beat this strainer. Although the handle is a little weak, it's good for susces, vegetebles and the ocassional dirty oil.